The manufacture of any product is an expensive endeavor that has caused numerous corporations to see red in the budget books. Purchasing expensive equipment may therefore be low on the to-do list, particularly as you prioritize other aspects of the process. For example, high pressure homogenizers are expensive pieces of equipment. Yet they can produce numerous products and may save you money in the long run if you plan smartly. Keep reading to learn how you can reduce the cost of manufacturing to support purchase and use of a high pressure homogenizer. For your company to see a profit, you must have both understanding and written documentation of the amount of raw materials used to achieve your product of interest. Specifically with large-scale homogenization, material needs are variable and subject to high costs, considering the quantity needed for manufacturing. In this case, taking account for potential overages within the budget will help avoid unnecessary and costly spending. Additionally, each raw material should be priced out. Having an understanding of legitimate corporations you will be able to purchase from, as well as where to turn for specialty raw materials, may significantly ease the mental and financial burden. 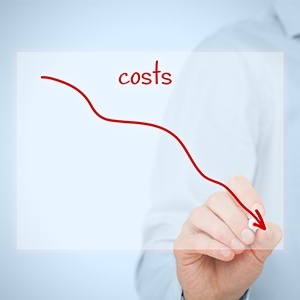 Although easily overlooked, utilities costs can quickly become burdensome in a manufacturing facility. Industrial homogenizers need to process significant amounts of product, which also requires significant amounts of energy.However, these costs can be decreased with some smart planning and research. Because coal and natural gas costs may vary by location, it will be smart to research how costly they may be at your facility. Plenty of proven methods of estimating and writing utility usage into a budget exist, and you will simply want to find the one that works best for you and your purposes. Ultimately, regardless of the above factors, it will be much easier for your laboratory to save money if you start with high-quality equipment. Not only will this ensure optimal product results, but it will also decrease the maintenance requirements. High pressure homogenization is the most common method for particle size reduction because of both its powerful mixing process and its cost/time effectiveness. The homogenizer will shear fluid by forcing it through a restrictive valve, forming a product with decreased particle size. BEE International is trusted by researchers around the world. We deliver an array of key benefits, such as production of nano/micro emulsions and dispersions and lipids and suspensions; these can be used in a variety of ways within the food & beverage, pharmaceutical, chemical, and biotechnology industries.